A comprehensive renovation of Baptist Medical Center Jacksonville’s maternity suites has commenced, providing new mothers with the highest level of care in a soothing and comfortable birthing environment. The $16 million project is expected to be complete in early 2020. A Family Advisory Group, comprised of moms and expectant moms, were central to the design process and provided valuable insight as to what features and amenities in maternity suites were most important to young families. Every maternity suite will provide a serene, hotel-like environment with décor and amenities designed to enhance the patient and visitor experience. 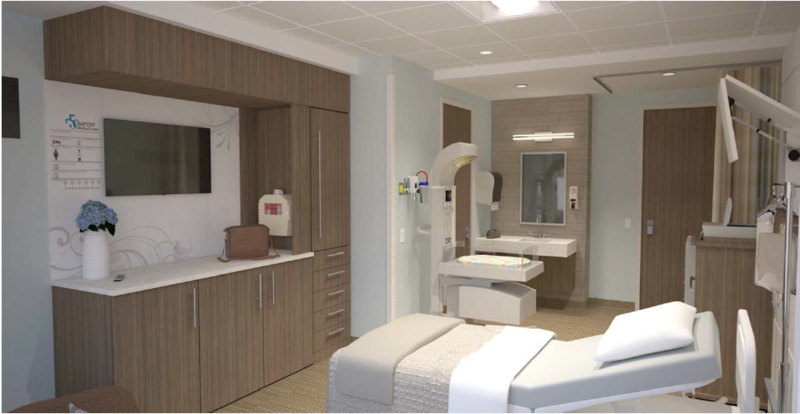 The rooms will be equipped with the latest labor and delivery technology for mothers to have the option of “rooming-in” – allowing the baby to be cared for in the mother’s suite after birth. As always, the specialized resources of Wolfson Children’s Hospital’s neonatal care will only be steps away, if needed. View the site renderings here.